Observational data from the Cassini spacecraft are used to obtain a chemical model of ocean water on Enceladus. 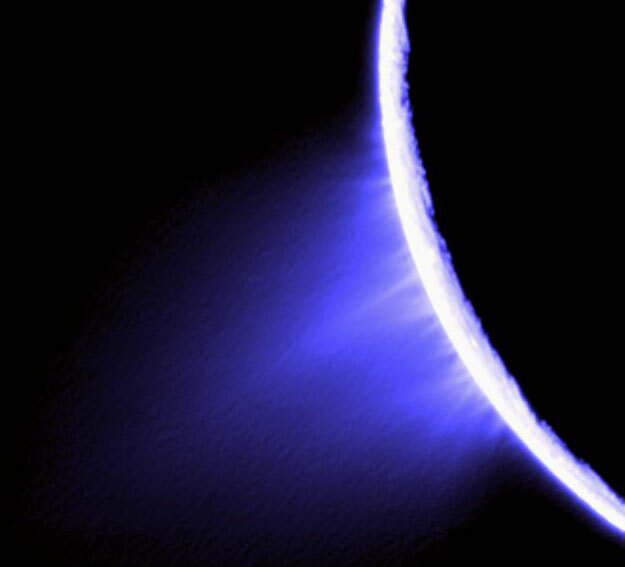 The model indicates that Enceladus' ocean is a Na-Cl-CO3 solution with an alkaline pH of ~11-12. The dominance of aqueous NaCl is a feature that Enceladus' ocean shares with terrestrial seawater, but the ubiquity of dissolved Na2CO3 suggests that soda lakes are more analogous to the Enceladus ocean. The high pH implies that the hydroxide ion should be relatively abundant, while divalent metals should be present at low concentrations owing to buffering by clays and carbonates on the ocean floor. The high pH is interpreted to be a key consequence of serpentinization of chondritic rock, as predicted by prior geochemical reaction path models; although degassing of CO2 from the ocean may also play a role depending on the efficiency of mixing processes in the ocean. Serpentinization leads to the generation of H2, a geochemical fuel that can support both abiotic and biological synthesis of organic molecules such as those that have been detected in Enceladus' plume. Serpentinization and H2 generation should have occurred on Enceladus, like on the parent bodies of aqueously altered meteorites; but it is unknown whether these critical processes are still taking place, or if Enceladus' rocky core has been completely altered by past hydrothermal activity. The high pH also suggests that the delivery of oxidants from the surface to the ocean has not been significant, and the rocky core did not experience partial melting and igneous differentiation. On the other hand, the pH is compatible with life as we know it; life on Earth may have begun under similar conditions, and serpentinites on Earth support microbial communities that are centered on H2 that is provided by water-rock reactions.